The Phillies return home tonight to complete a home-and-home series with the Red Sox while also looking to snap a seven-game losing skid. The club dropped both contests in Boston, pushing both to extra innings. 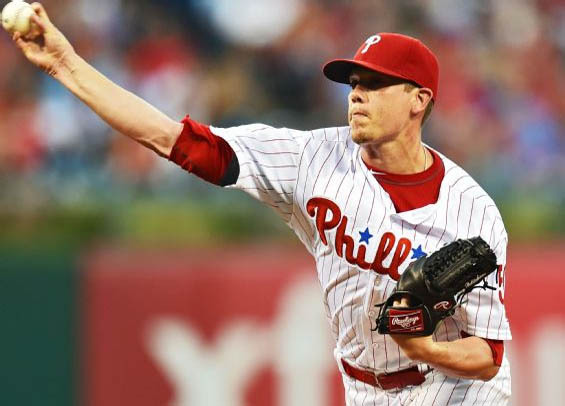 Jeremy Hellickson surrendered 10 hits and three runs over six innings in his last start, a loss in St. Louis. He's averaging a little more than four strikeouts a game, two below his career average. The lack of strikeouts is compounded by the fact his swinging strike rate this year compared to last is down nearly 14%. "It's a pitch he needs to work on right now," manager Pete Mackanin said last week. "He needs that pitch to be successful to help locate his others." For his career, Hellickson is 4-3 over 14 starts against the Red Sox with a 4.41 ERA. A bright spot for the Phillies in the two games at Fenway Park was the reemergence of Maikel Franco. The struggling third baseman went 6-for-9 and collected two doubles to go along with a pair of walks. He's now hitting .227 on the season. For the Red Sox, hurler Brian Johnson is making just the fifth start of his major league career. He was knocked around a bit in his last start, lasting just 4 1/3 innings against the Tigers while surrendering eight hits and three runs. Cesar Hernandez is expected to miss six weeks with an oblique strain, but general manager Matt Klentak admitted Wednesday he's not yet interested in promoting Scott Kingery to majors. The 23-year-old has slugged 18 homers and driven in 35 RBIs while hitting .300 for double-A Reading. He currently is ranked as the 11th best prospect in the Phillies' organization by MLB.com.